Diamond Rings – Enticement To The Eyes! Witness the rendition of beauty in the form of diamond rings designed only at Joyalukkas. Diamond rings with its bliss are made from the finest and talented skill in town. The design customized to the latest trends that make you feel on top of the world. Joyalukkas diamond rings glimmer with uniqueness and admiration. Welcome the diamond rings endurance! Utmost consideration has been taken in the making of this wonderful masterpiece. The journey of the rings has been planned and reconstructed with care. These eye-catchers would take you to a surreal dimension filled with smiles and delight. Explore your inner beauty by showcasing these everlasting rings. Diamond Rings Online Shopping – Perpetual Bliss! Today, rings for women are considered to be the statement with regard to style. We have a variety and a good range of exclusive hand-selected rings. They include elegant drop rings with radiant diamonds and opulent gemstones. You have an option to choose from a wide range from this product line. There are facilities to buy the diamond jewelry rings online. Just visit our e-commerce platform to know more. We showcase the classics to ethnic ring designs, from traditional to contemporary styles. These unique diamond rings are designed with the finest showmanship and quality. The diamonds and gems are structured with the finest shape and proportion. You can buy online diamond rings and get a feel for all our varieties and style. Easy and Lights: Stud rings, Drop Rings, Also the Hoop Rings. Trendy Ones: Sui Dhaga rings and many more. Online Diamond Rings Shopping – Click To Be Charmed! The variation in rings will suit your wardrobe. 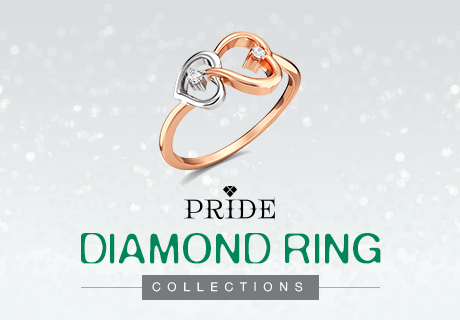 Buy diamond rings online to look star studded this festive season. You can even gift these beautiful diamond rings for occasions like weddings, anniversaries, and birthdays. Don’t forget that romantic date that can be memorable by gifting a pair of rings to your loved one. We provide the best diamond rings online to give you a chance to express your exuberance and glamor.